Straight out of a magazine! Erica's hip Nautical theme baby shower diaper cake is downright adorable! Very boyish and very cute! The colors go so well and the simplicity is most attractive. She tops it all of with a splash of red with the little flag topper - delightful! Erica is among our growing list of readers and contributors who have taken of their time and talents to share their ideas to inspire countless others whom they will never meet, but will be joined by a common thread of creativity and a DIY desire to create something pretty, something unique and something to celebrate life. Magnifique! Thanks so much for sharing your darling diaper cake Erica! I have made several diaper cakes for family members, so when I found out my friend was expecting, I couldn't wait to get started on hers. Then I found out she was planning to use cloth diapers. This is my first ever cloth diaper cake and I am very pleased with the results. 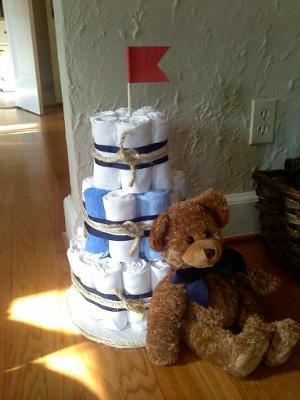 I used 2 12-packs of cloth diapers and then used other things off her registry to fill in the rest of the cake. First I roll the diapers, onesies, bibs, and washcloths individually to be all around the same size, securing each with a rubber band. Arrange them all into layers around the champagne, hiding the onesies and bibs inside if the colors don't match the theme. Try to use the diapers on the outside of each layer.I scattered the washclothes throughout the middle layer because they happened to be in nautical colors, tucking in some travel sized baby shampoo, baby oil, baby powder, and baby lotion around that layer as well. use 3 cake dowels to make sure the top layer is secure, since the champagne bottle won't be tall enough. As you build each layer, secure with a larger runbberband. Once you have everything in place, add the navy and white ribbon (covering the rubberbands), and secure in the back with straight pins. Tie the rope around each layer on top of the ribbon and make knots in the front. Cut a nautical flag from red cardstock (I did the "B" flag because that's my friends last initial) and glue it to a cake dowel. Cut the dowel in half and stick it in the top of the cake. To make the base, trace a large plate on 3 pieces of cardboard. Once you have the 3 circles, glue them together and cover them with white tissue paper, securing on the bottom with scotch tape. Use glue to trim the circle with rope. because this is a centerpiece, I added the bear leaning up against the cake and used the extra navy ribbon to make him a bow tie. This is, of course, optional.